Cook rice noodles using the instructions for hot water preparation as directed on package. (You can also boil to speed up the process slightly.) Drain. Drizzle noodles with 1 tablespoon melted coconut oil, toss to coat and set aside. Mix together turkey, soy sauce, garlic and ginger. Brown in a skillet until cooked through, then set aside. 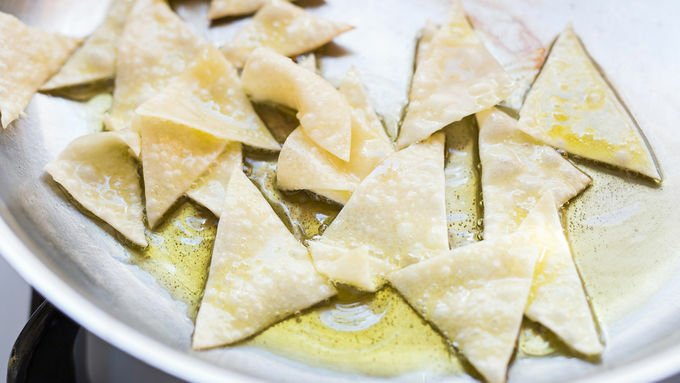 Melt 3 tablespoons of coconut oil in skillet and fry egg roll wrapper strips just until golden. Set strips aside on a paper towel-lined plate to drain. 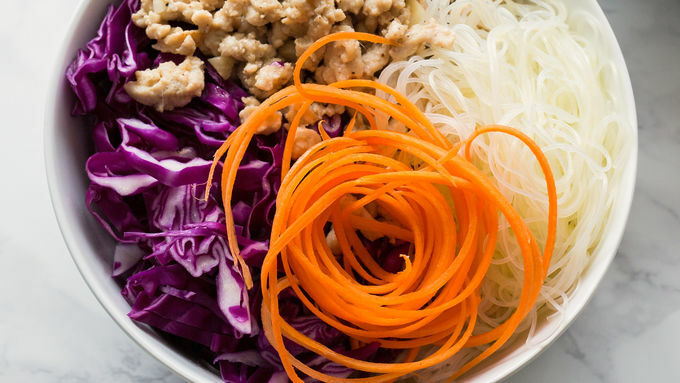 Divide noodles between four bowls and arrange with cabbage, turkey and carrots. Whisk together vinegar, sesame oil and sweet and sour sauce to make dressing and drizzle over bowls. Garnish with cilantro, green onions and nuts (if desired). If I could eat egg rolls every day for the rest of my life, I would. Except for that pesky part about life where I am attempting to eat more of the stuff my body needs (veggies and protein) and less of the stuff it doesn’t (all-fried everything). It’s that whole “being well balanced” goal I keep setting for myself. 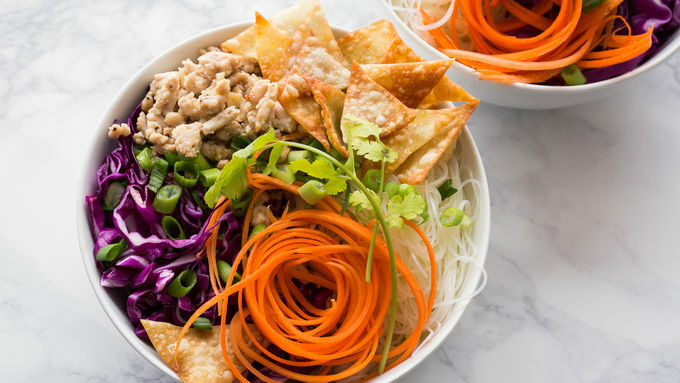 So, imagine my delight to discover the concept of a “deconstructed” egg roll bowl. All of the best parts of an egg roll, tossed with all the best parts of a salad, served with just a sprinkling of crunchy fried egg roll strips. Because, balance. This dish comes together quick. 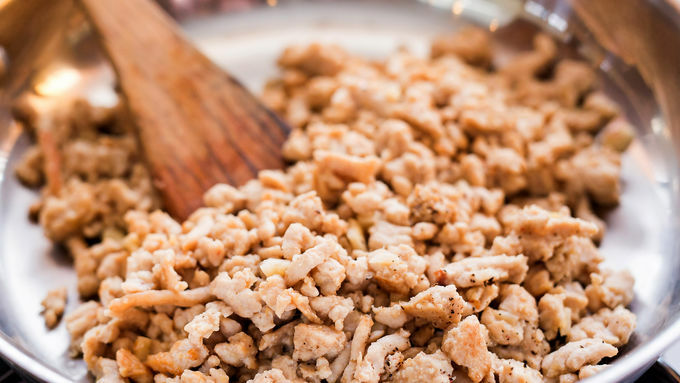 A quick cook of ground turkey, sautéed with garlic, ginger and soy. Fresh carrots, purple cabbage and cilantro on top. A drizzle of sweet and sour dressing. A crumble of crushed peanuts. This dinner is perfection. 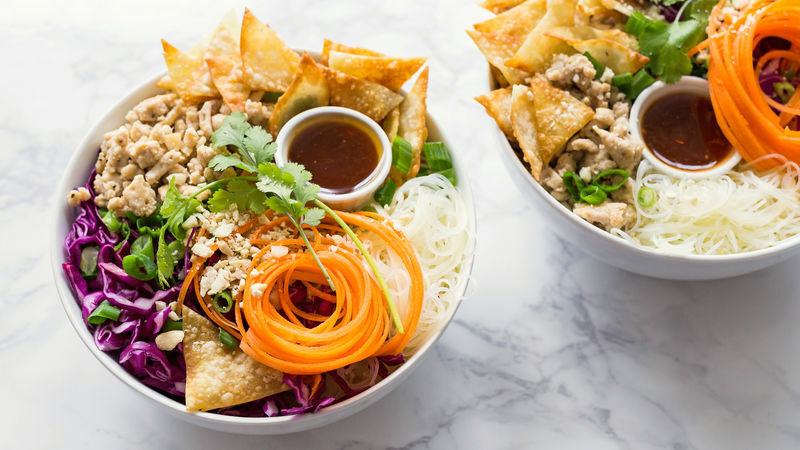 Everything you’re craving, from noodles to greens, topped with crispy fried wontons and served with a fork (or chopsticks, if you please). Delicious!